"We question a country's self-mythology. Perfect town and perfect family are - like Westerns - part of America's mythology, involving notions of past innocence and naïveté. But is it possible for innocence to exist while something heinous transpires elsewhere? What does it take for a country to be rich and prosperous? What does that country do to the world?" I absolutely loved Get Out - it's satire, it's a thriller, and it's body horror. Yes, body horror. While not as visceral and gore-filled as traditional body horror films, this is the first film I've seen, marketed as a HORROR film, that features the deconstruction and mutilation of the black body as a narrative device. Body horror is defined as "a horror film genre in which the main feature is the graphically depicted destruction or egeneration of a human body or bodies." Plots often revolve around around science experiments gone wrong, infection, decay, mutilation, self-harm, mutation, and other plot devices in which one's own body becomes The Other. When looking at body horror films that are considered representative of the sub-genre (i.e. The Fly, Videodrome, Re-Animator, The Thing, Society, etc.) a pattern quickly becomes apparent - nearly all of the films feature a white, male lead as patient zero. Therefore, body horror has traditionally treated the white male body as the pinnacle of health and perfection upon which infection, disease or mutation descends. It is presented as the perfect whole, an unblemished specimen that remains pure until disintegration or decay begins its gruesome work. More recently (though still with less frequency) we've see the release of a number of woman-centered body horror films with movies such as Thanatamorphose, Contracted, and In My Skin. Even so, in nearly every case, it is the white body that becomes the locus for decay. The absence of black bodies in body horror films is glaring. It implies that the white body is the only body with inherent value and innate purity. It is the only body that has the ability to be tainted. Conversely the black body, from its inception, is viewed as flawed, defective, diseased and lacking the value that white bodies carry. Its decay, destruction, mutilation, etc. is an impossibility, because it is assumed to never be or have been in a pure state. The idea of black bodies as being inherently tainted and abnormal has roots in US history. One only needs to consider concepts like the "one drop rule" - also known as hypodescent - which classified mixed-race persons as minorities due to their black ancestry. In states like Virginia and Louisiana, whites codified the boundaries of race, a move which was rooted in the view of black bodies and blood as a source of impurity, in which even a drop of black blood was considered a contamination of the white body. It is also visible in a recent study which discovered that people see black men as larger, stronger, and more threatening than white men of the same height and size. And of course, notions around purity and biology are also a cornerstone of Nazi ideology. This, I believe, is part of the reason we never see body horror films using black bodies. Though at times the manner in which the body is treated in slave narratives - as a recipient of suffering, pain, mutilation, dismemberment, and destruction - actually overlaps with themes found in the body horror genre, these films are specifically NOT marketed (rightfully so) as body horror films. But depictions of black body horror are otherwise rare. One exception, in which black enslavement is treated as a type of body horror experience was in the third season of American Horror Story. The storyline, which took place in New Orleans and centered around a coven of witches, featured Kathy Bates as Delphine LaLaurie, a non-fictional, historical figure and socialite known for her cruelty. While the people she tortured were her slaves, the focus of this storyline on the show wasn't on their enslavement and potential emancipation, but on the mutilation, torture and suffering inflicted on their bodies. While Get Out is less graphic than traditional body horror films, it can be argued that it is the first horror film in which the black body is treated in the same manner we see white bodies treated in the genre - as starting from a pure state, having intrinsic value, and having the ability to be corrupted. Despite the fact that the film opts for metaphor rather than a graphic display of gore in an effort to serve as an allegory for slavery and the numerous ways in which blackness is mined for its gifts, Get Out at its core deals with the (desired and anticipated) dismemberment and mutilation of a black body. Even more importantly, viewers are asked to experience what it's like to live in a black body. With Chris as our guide through the film's narrative, by the end of the movie our goals and values align with his. He is us, and his survival is our survival. 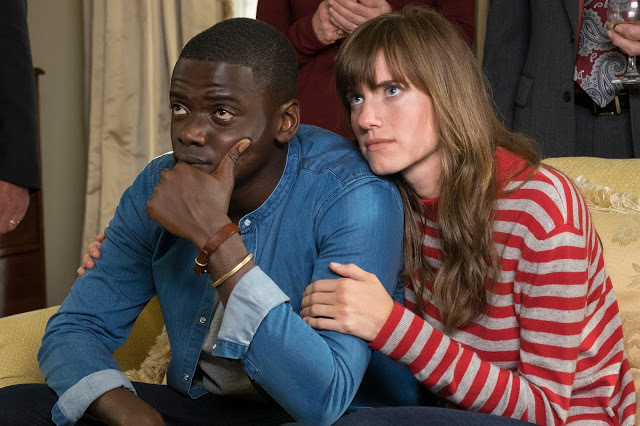 A large part of Get Out's brilliance is that it takes narrative risks to demonstrate to viewers that racism, and the subsequent appropriation of black bodies, is what TRULY constitutes body horror. The destruction and disintegration of black bodies with the goal of using them to advance white supremacy's agenda is reality, and it continues to occur in everything from prison labor to sports. Get Out not only highlights the terror of Chris' experience, it also illustrates the pathology of a society that seeks to deconstruct and dismember the black body, then use its constituent parts for its own gain. This film is something special, and a march into new territory for how the horror genre defines concepts of body horror. The film's overwhelming (and some would say surprising) success with diverse U.S. Audiences is - I hope - a small indication that we as a society are slowly, but increasingly, open to stories from the margins, and that we are ready to begin seeing black bodies as what they truly are - beautiful, pure, healthy and whole; deserving of care, respect, and autonomy free from the shackles of white supremacy.